As the video streaming battle in India heats up, Netflix has reportedly started carrying out trials in India for its mobile-exclusive subscription plans. The said plan will only allow viewers to stream Netflix titles in standard definition (SD) 480p and costs Rs 250 for a month’s access. To put it in perspective, Netflix’s Basic plan is priced at Rs 500 and like the Mobile-only plan offers content only in 480p. We were able to access the mobile-only plan details through Netflix India sign-up process. Like all its other plans, Netflix is offering its services for free till a month after which users will have to pay Rs 250 for continued access to films and TV shows on Netflix. The new Mobile-only plan comes after CEO Reed Hastings had claimed during his visit to India that the next 100 million subscribers will originate from India. At the time, he had also referred to the 300 million massive mobile phone user base in India and the mobile-only plan seems to be a part of that expansion plan. With the Internet being easily accessible in India at affordable rates, video consumption has seen exponential growth. As per a 2018 report by KPMG India, the analysts concluded that at its current rate of growth, India would be second in terms of global video consumption and would boast of 500 million viewership by 2020. Even after the Mobile-only plan, Netflix remains the video streaming platform with the highest subscription prices in India. With players like Hotstar and Amazon Prime Video already offering their services for Rs 199 and Rs 129 per month respectively without any restrictions, will Netflix’s mobile-only plan appeal to Indian viewers? We’ll know when the company officially launches the plan in India. According to a report, Netflix released a statement confirming the ongoing trials. 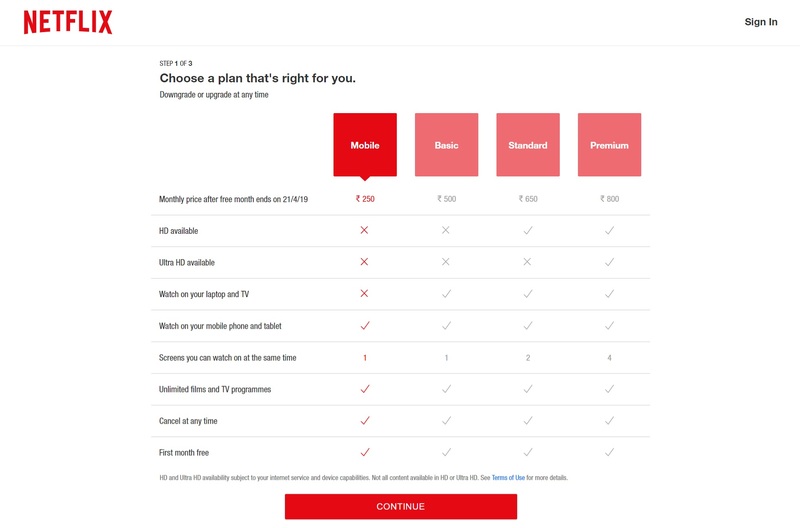 "We will be testing different options in select countries where members can watch Netflix on their mobile device for a lower price and subscribe in shorter increments of time. Not everyone will see these options and we may never roll out these specific plans beyond the tests," the statement reads.